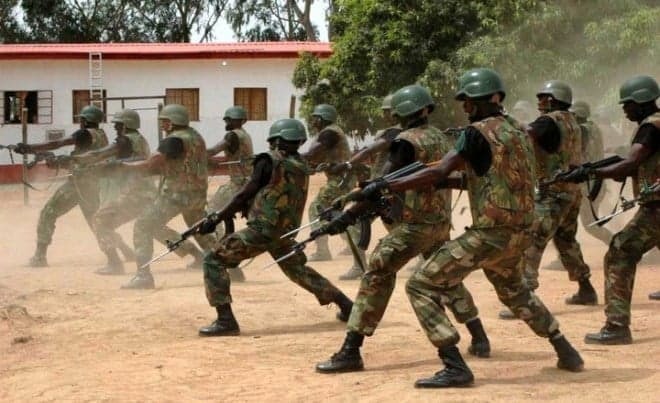 The Theatre Commander of Operation LAFIYA DOLE, Major General Benson Akinroluyo has called on call newly-promoted Generals to increase their proactiveness in the fight against insurgency. Akinroluyo, who decorated most of the senior officers, said the only way the soldiers could reciprocate the recgnitio is to do their best to win the battle. The colourful event took place at the Maimalari Cantonment Officers’ Mess, Maiduguri where officers from the 3 sectors combating insurgency were decorated with their new badges of Brigadier General. Akinroluyo said the massive elevation for the officers in the theater was in recognition and reward for dedicated service and resilience in the fight against insurgency in the North-eastern region of Nigeria. Amongst those decorated were: Brigadier Generals Chima Solomon Okafor, Adekunle Adekeye, Ademola Taiwo Adedoja, Alechenu Mike Alechenu, Ibrahim Garba Lassa, Solomon Abidemi Alamu and Sani Abdullahi Gumel. Others include: Brigadier Generals Valentine Uzochukwu Okoro, Olatokumbo Musiliu Bello, Abdulsalam Enesi Abubakar, Hamidu Ohimege Abubakar, Abubakar Hadejia Ahmed, Omotoso Jacob Ariyo and Brigadier General Ado Apollos Galadima. Dignitaries who witnessed the occasion were the Commander Sector 2 and 3 of Operation LAFIYA DOLE, Maritime Component Commander, Chief of Staff Theatre Command, Heads of paramilitary security agencies in Borno state. Others were: members of the Nigerian Army Officers’ Wives Association (NAOWA), unit commanders and principal staff officers at Theatre Command Operation LAFIYA DOLE and Headquarters 7 Division Nigerian Army amongst others.